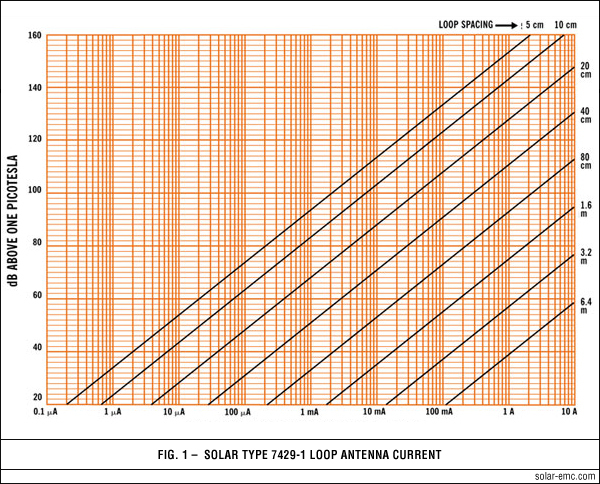 when using the dimensions of the Solar Type 7429-1 Loop and a distance of 5 cm as required by Test Method RS01 in MIL-STD-461A. In other words, plugging in the required dB/pT will give the current needed through the loop to establish the magnetic field of the specification. The current-versus-frequency required to meet the levels specified in the Test Method RS01 has been determined by this method and plotted on the graph above. 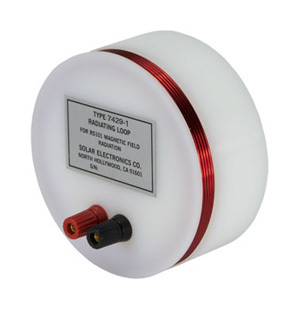 Originally, the Type 7429-1 Loop Antenna was intended for generating a stipulated magnetic field at a distance of 5 cm as required by Test Method RS01 of MIL-STD-461A. However, EMI engineers in the field have asked for information concerning the amount of current through the loop to achieve magnetic fields at distances greater than 5 cm. Figure 1 indicates how the current through the loop varies with distance and with magnetic field levels which may be required by other programs. For distances greater than 20 cm and a given current, as the distance is doubled, the field intensity becomes 18 dB less. As the current is multiplied by ten, the field intensity increases by 20 dB. In other words, the field intensity change in dB is twenty times the log of the change in current at a given distance.